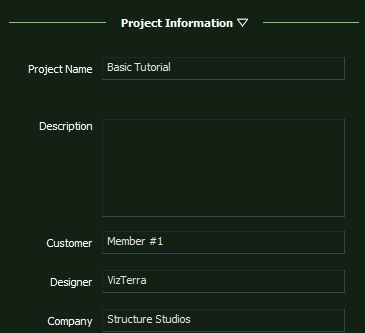 This tutorial offers an introduction to the fundamentals of working with VizTerra. By the end of this tutorial, you will have created a custom house shape, a basic water feature, hardscapes and raised areas, and planter beds, as well as a fully landscaped project complete with site amenities. It is recommended that you read and understand the Getting Started and Creating Your Scene sections of this help system before attempting this tutorial. Start VizTerra. Select New Design from the Main Menu. The first stage is Project Information. Complete the text fields in the Panel by single-clicking on the field with the left mouse button and then using the keyboard to enter text. This data will be used in the Presentation Mode. Preview the scene in 3D by positioning the cursor at the top of the viewport and single-clicking on “3D” using the left mouse button. Adjust the 3D view as described in the VizTerra layout section of Getting Started. The house will be displayed with a default material (a different material may be applied later). The Terrain stage has a split screen. 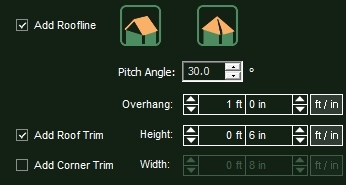 The top screen allows you to place slope points in your design on the property slope line. The bottom screen shows a profile of the points and their elevations. In the top screen, place a slope point 33 ft 10 in from the top left corner of the back of the house. 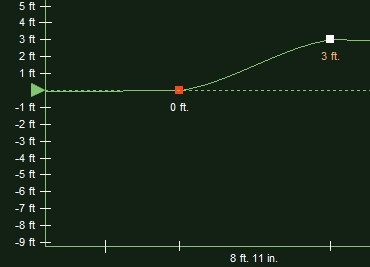 Under Parameters, set the point to 3 ft in the Height box. Create a second point, 5 ft 10 in down from the first point. Set the height of this second point to 0. Only shapes drawn in the Walls and Fences stage may be incomplete shapes and still show up in 3D. 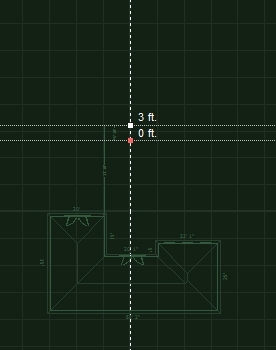 Every line segment or arc is automatically rendered as a wall. 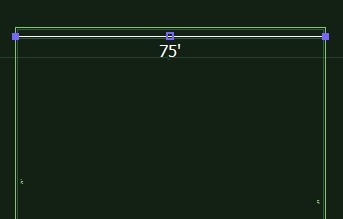 Use the line tool and draw the wall shown in the image. When you reach the end of the shape, left click on the last point you drew to stop drawing. Take a look at the completed wall and house in 3D. Notice how the wall conforms to the sloped terrain we created in the last stage. Go back to 2D and we will now create a retaining wall. Draw the retaining wall shown in the image. It is placed 5 ft 10 in below the back line of the wall we just drew. Under stage options set the height of the retaining wall to 2 ft. Remember to click on the end point to stop drawing. 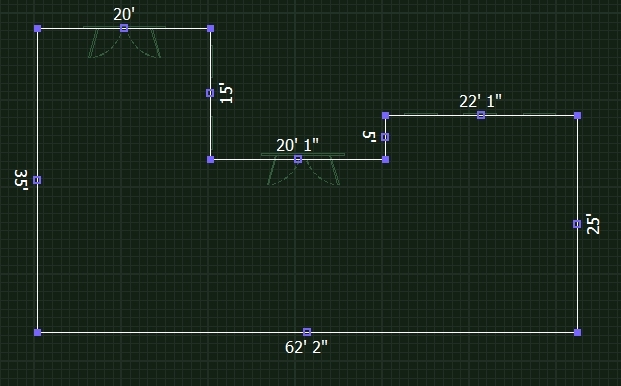 We shall now draw a water feature using the line and arc tools. Water features are bodies of water such as ponds and basins. Activate the Line Tool and draw the two straight segments that form the corner of the shape shown in the image. 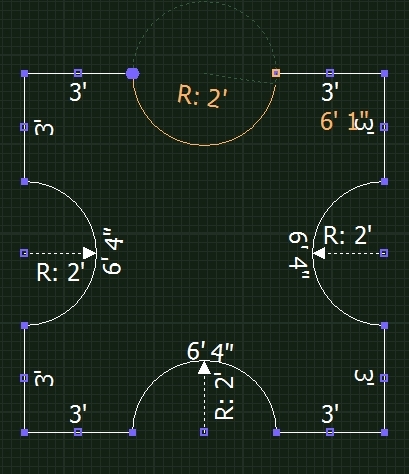 Now select the Arc Tool and move the mouse to create a dotted circle with a radius of 2 ft. Left click to set the radius of the circle. 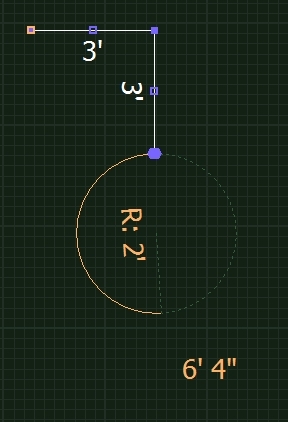 Trace the circle with the mouse to draw the arc, and then left click again to confirm the arc. 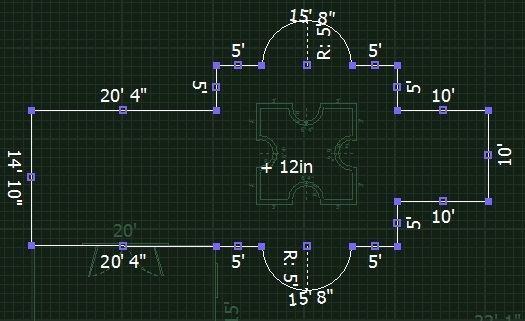 Change back to the Line tool and continue with the straight segments. Use the arc tool again to draw the second arc and use the line tool to complete the shape where you started. 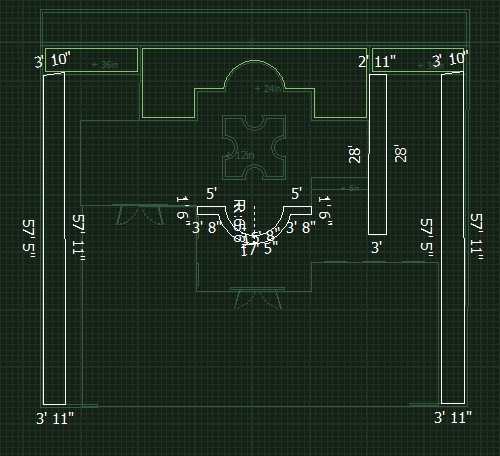 Go to Stage Options and set the height of the water feature to 2 ft.
Use the move tool and place the water feature in the center of the yard about 17 ft from the back of the house. Go to 3D and take a look. Return to 2D and click Next Stage. Now we shall add hardscapes to the design. In this stage we will make use of the outline tool. First we will draw a raised area that connects to the left wing of the house and surrounds our water feature. Start by going to the Hide/Unhide section of the Panel. Click on Roofing to hide the roof. This makes it easier to see the lines of our house. The outline tool works in a series of clicks. 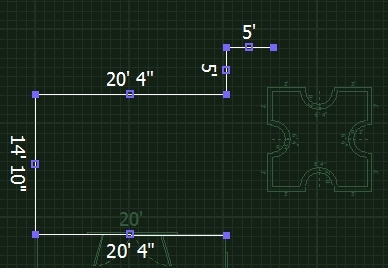 When you first click on the outline tool you will have a question mark icon. With this click you select the shape you want to outline. 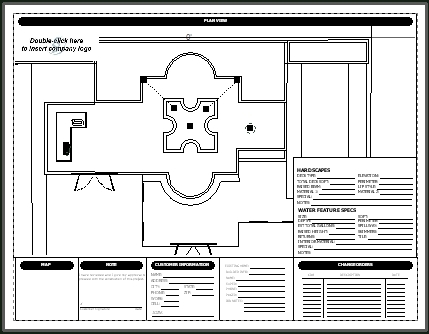 Select the outline tool and left click on the right inner corner of the left wing of the house. Now your cursor has an arrow in between a solid line and a dotted line. This click determines the offset distance. 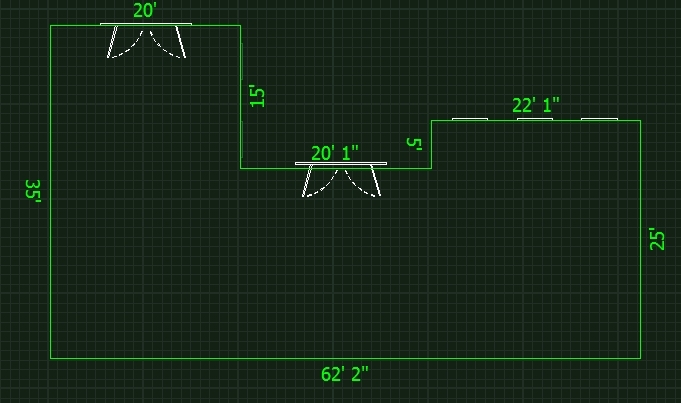 We want to trace right on top of the house so our offset will be 0 ft. Left click on the line of the house. Now your cursor has just two lines. As you move your cursor, it traces the line of the house. Trace across the front of the left wing of the house. Left click once you have reached the left corner. 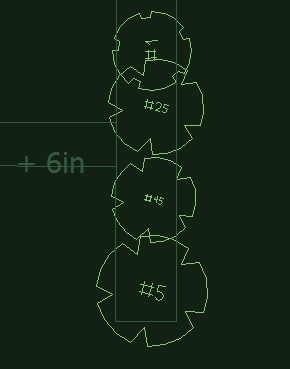 Now switch to the line tool and draw the segments as shown in the image. Now use the arc tool to draw the next segment. 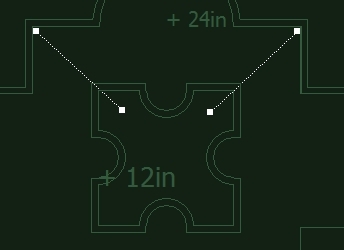 Switch back to the line tool and draw the segments as shown in the image. Complete the shape as shown. Once it is complete, give it a height of 1 ft using the controls under Stage Options. 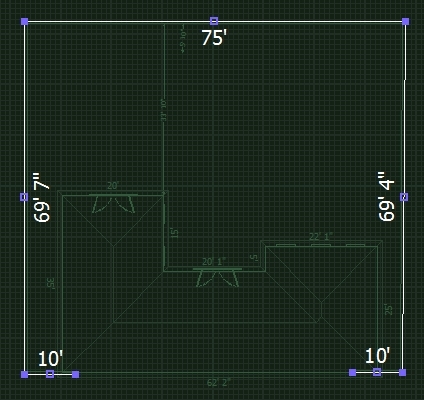 Use the outline tool along with the line and arc tools to create a second raised area behind the shape we just created. Set the second raised area to 2 ft under Stage Options. 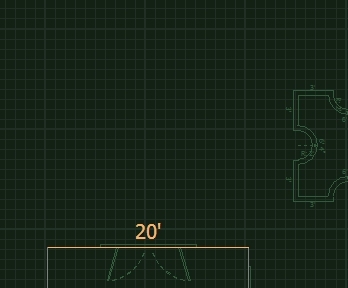 Create two planters in the corners of the yard with the line tool. Set them to 3 ft under Stage Options. Finally, we want to create a step at the base of our area. 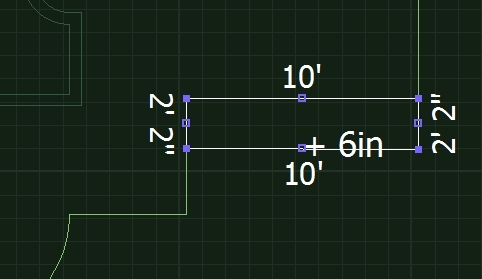 Draw the step shown in the image and set its height to 6 in. Take a look at it in 3D. Now that we have completed our hardscapes we will add a coping edge. First we return to 2D and select all of our hardscapes. 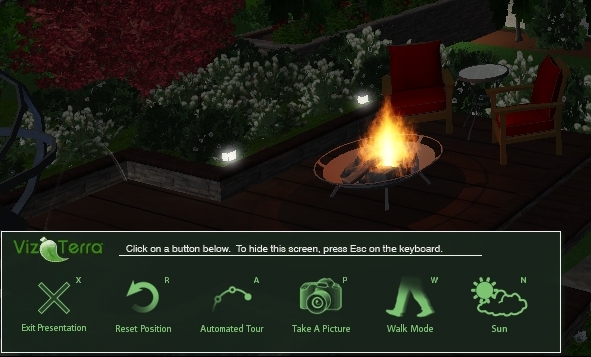 Left click and use the CTRL key to select all the hardscapes. Under Stage Options click on the Add Coping check box. Set the coping width to 6 in. Click on the Round lip style. Go to 3D. The surfaces we created now have a 6 in coping edge. Go back to 2D and click Next Stage. We will now be adding planter beds to the design. This stage allows you to create planting areas filled with soil or other materials. Drawing planter beds on top of the planter structures we created in Hardscapes allows us to create raised planters. 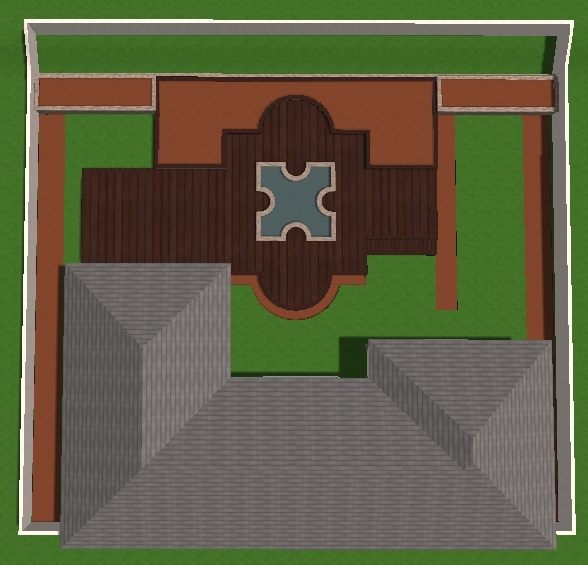 Use the outline tool to create the three planter beds on top of our existing hardscapes as shown below. Planter beds have a depth control under Stage Options. This allows you to adjust how deep the fill is. Set the depth of all three planter areas to 6 in. Planter beds do have to be placed on hardscapes, they can also be placed directly on the ground. Draw the four planter beds shown below directly on the ground. For the smaller one use the outline tool, while all you need is the line tool for the larger ones. Take a look in 3D. Notice how the planter bed created against the retaining wall follows the curve of the slope. Planter beds drawn on the ground will always follow the slope of the terrain. The Materials Stage allows you to apply different materials to surfaces and objects in your design. All work in the Materials Stage must be done in the 3D view. Go to Quick Selection in the Panel. Click on the Hardscapes button. This selects everything that was created in the Hardscapes Stage. Now open the Materials Library. This library contains all the materials that can be applied. Go to the Wood category and open the Decks group. Select the material Long Wood, Dark Brown and double click to apply it. Now all our hardscapes have the same wood material. Now click the Planter Beds quick selection button. Notice how all the planters beds are highlighted in red as shown in the picture. Whenever a surface is selected in the Materials Stage it will highlight in red. Go to the Earth category and select the Wood group. 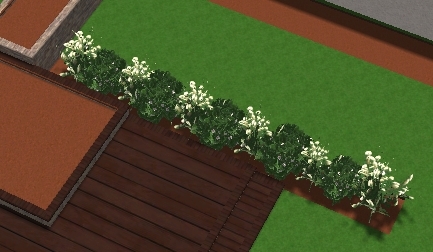 Double click on the Mulch 1 material to apply it to all the planter beds. You can also select individual surfaces to apply materials. Double left click on the interior of the water feature. Go the Stucco category and open the Spanish group. Double left click on the aqua material. Every surface in the design can have a different material applied to it, including the house, roof, ground, and more. Try applying your own materials to the design. When you are done, click “Next Stage”. This stage allows you to place water and fire effects into your design. This stage has a unique library called the Visual Effects Library. Open the library to the Water Features category. Select the deck jet and click the Insert Multiple button. Place one deck jet in each of the corners above the water feature. The deck jet is represented by a dotted line with two ends. Use your mouse to move the end points so that the jets spring from the corners of the raised area into the top corners of the water feature. The Visual Effects library has controls for all of the water and fire effects allowing you to set the height, radius, and more. Take a look at the deck jets in 3D and then click “Next Stage” when you are ready. In this stage you will add plants and trees to this design. 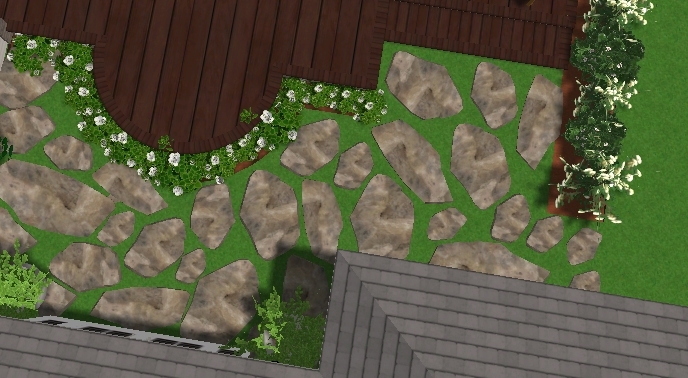 This stage has special tools to make landscaping look natural and allow you to customize the landscaping symbols. First we will start by finishing the planter bed in front of our raised area. Go to the Library and under the Landscaping Tab, select the Shrubs category, and the Accents group. Click on Azalea Indica and select the white one. Now click once on the Insert button. 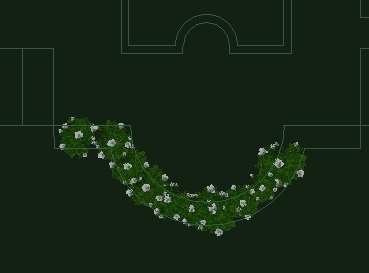 Every time you left click a different variation of the flower will be placed in the planting bed. Keep placing the flowers until the bed is full. Next we will fill the planter to the right side of the raised area. Go to the Shrub Category and open the Deciduous Group. Select the Fothergilla gardenii and choose the Bloomed variation. 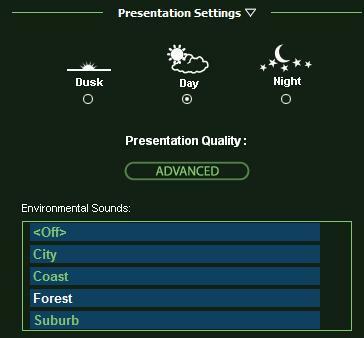 Now check the Show Symbols in Library and Default New Landscaping to Symbols check boxes. You will notice the shrub is now represented by a 2D landscaping symbol. Underneath the library you will see a box labeled Plant Options. Move the slider to change the Contain Class of the symbol. 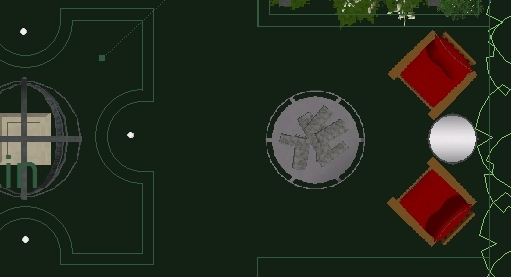 This allows you to place symbols to represent the actual size of the shrub you will plant. Place different container sizes of Fothergilla gardenii as shown in the image. Lets take a look at the design in 3D. Although we placed symbols for different container sizes, the plants are all shown full grown in 3D ready for presentation. VizTerra also automatically keeps track of every item you place and can display a legend of every item in the Construction Stage. 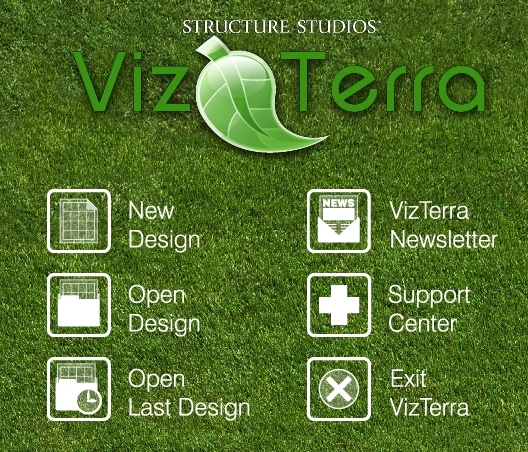 VizTerra allows you to choose from thousands of landscaping symbols or create your own. 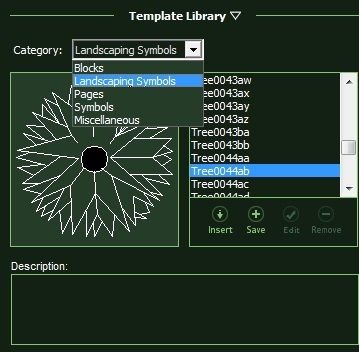 To change the landscaping symbol for a plant or tree, simply select it in the library and press the Edit button. 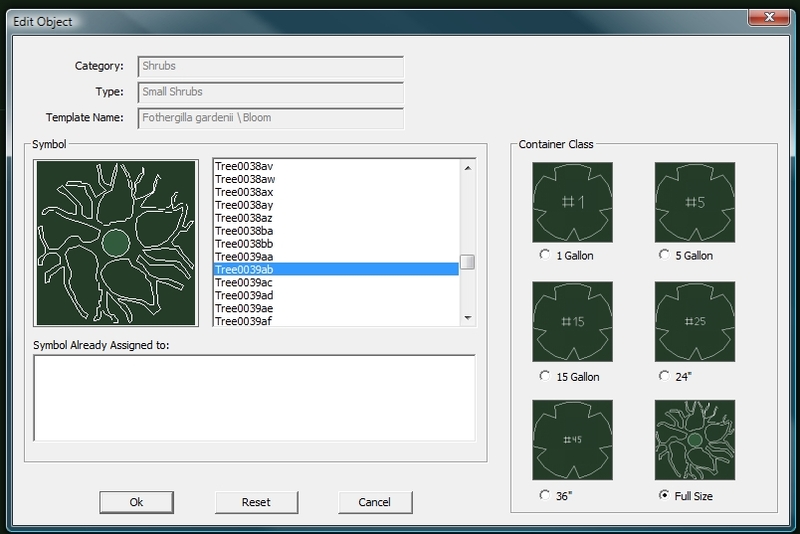 This allows you to select a unique symbol for every container class of each plant and tree. The edit object box will also tell what other objects a symbol is assigned to. Now choose some other trees and plants to fill the yard. Place them as shown in the image. As you can see Plants and Trees may be placed anywhere in the design. Click “Next Stage” when you are ready. Now let us complete the yard with Site Amenities. For the first item, we will use the Library. Select the Small Patio Chair in red located in the Chairs group under the Furniture Category in the Design Tab. Now click the Insert button. Insert four chairs on the raised area to the left of the water feature. Now open the Tables group and select the Metal Patio table. 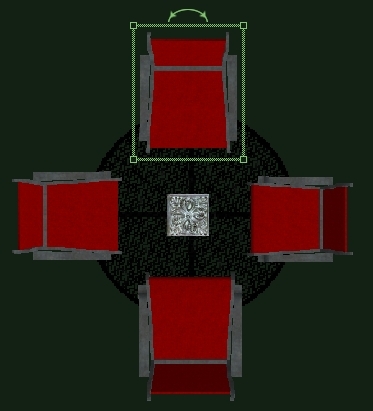 With the move tool position the chairs around the table as shown in the image. 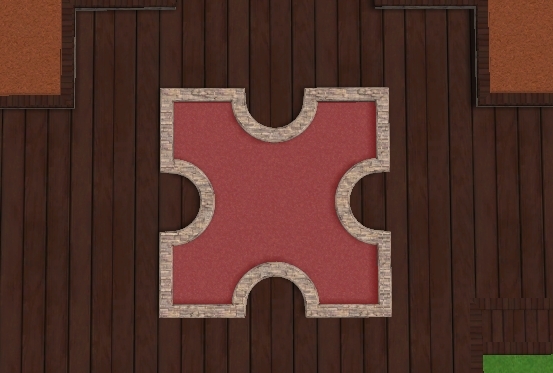 Notice how the chairs and table have a border with a double arrow. Clicking on the double arrow will allow you to rotate the chairs with the move tool. Now we are going to place an ornamental item inside our water feature. Go to the Accessories category and open the Miscellaneous group. Select the Armillary Sundial, large and place it in the center of the water feature. Now go to the Structures category and open the Fireplaces group. 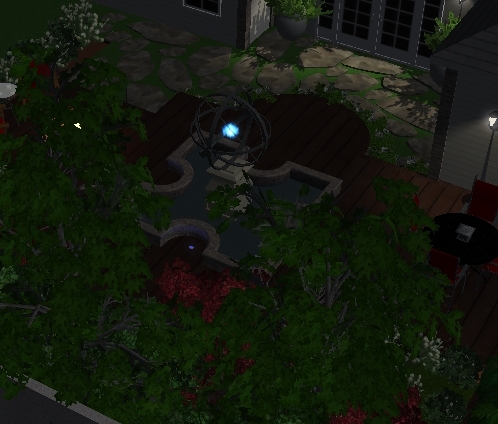 Select the Type 3 fire pit and place it to the right of the water feature. Complete the right side of the raised area with chairs and a table as shown. This is also the stage where you will place lighting. The library includes light fixtures for the house as well as lighting for the yard. Go to the Lights category and open the Landscape Light group. Select Landscape Light Type 2. To properly place the lights we will first hide all the plants and trees under Hide/Unhide. Now with the Insert button, place 11 lights as shown in the image. Now take a look at it in 3D. Press the N button on your keyboard twice to enter night mode and turn on the lights. Press N again to return to day mode. Many design elements can be added in the Site Amenities stage. One advanced technique is creating the rock pathway shown in the image. Add more items from the library to your design. Click Next Stage when you are ready. This stage allows you to display your project as a fully interactive 3D presentation. You may set the time of day here or while in the presentation. 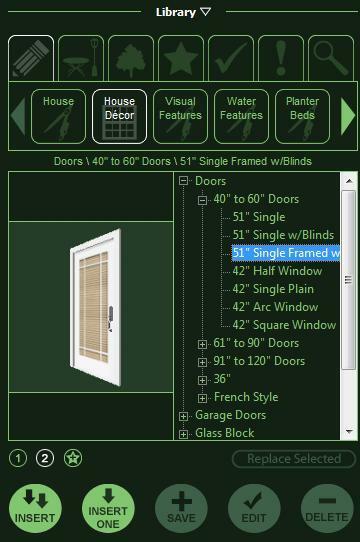 You may display customer and designer information as well as a company logo. When you are ready to start the presentation click the friendly garden gnome and Create Presentation. The Presentation Mode menu may be brought up by pressing the Esc key on your keyboard. You may access any of these commands by pressing the button in the menu or using the hot keys listed. The Sun button allows you to switch between day, dusk, and night. Walk mode allows you to present your design as if walking on the ground. Fly mode allows you to present the design from any point in or above. Take A Picture allows you to create a screenshot of your presentation that is saved in the screenshots folder. This screenshot may be emailed to customers or printed out. The Automated Tour will rotate through your design. Reset Position will restore your view to the starting position. This is helpful when in fly mode. Exit Presentation stops Presentation Mode and returns you to the stage. To move around in Presentation Mode, hold down the left mouse button to move forward and the right mouse button to move back. Turn the mouse to move your view from side to side. Once you are done with Presentation Mode press X to exit and then click on Next Stage. Every Page is made up of several blocks. We are going to edit the Customer Information block. Left click once on the Customer Information tab in the block list and select the Customer Information Block. Now use the mouse to zoom in on the selected block. 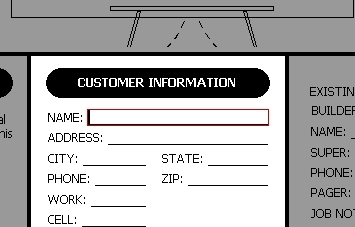 Fill in the lines by double left clicking on them and typing in the information on the keyboard. Congratulations, you have successfully completed your first VizTerra project. If you have not already, please save your design now for future use by selecting Save from the File menu.